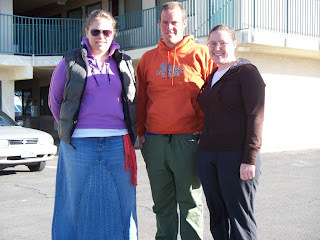 Tonight's post is of the visit Lindsey and LaRae paid to Cody back in December. 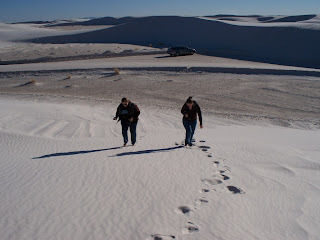 For Lindsey's post on the visit, click on over to "Lindsey Checks In." LaRae just sent Cody a "Rock of Gibraltar" birthday cake with rainbow chip frosting! ("Rock of Gibraltar" is Cody's phrase to describe something huge and awesome.) I don't know how she packed it that it survived the trip, but Cody picked it up at the post office this week and enjoyed it hugely. 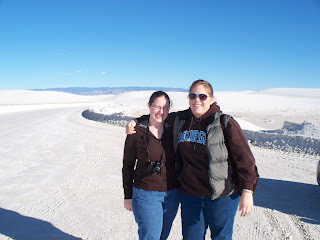 Lindsey and LaRae at White Sands. Cody poses with the girls. 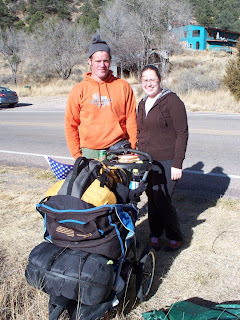 Cody and Lindsey with the heavily burdened stroller. Cody and Lindsey have been roomates before, and they get along swimmingly. 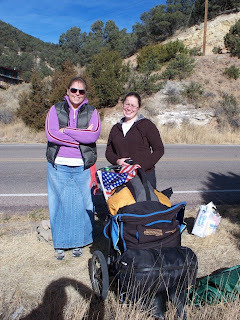 I'm glad Lindsey got to share some of his journey, even if she was a wimp and didn't actually WALK with him! And that's all for tonight... Thanks for bearing with the slow speed at which I am posting pictures. There was such an overwhelming number, my little librarian brain just feels more comfortable slotting the pictures into rather arbitrary sub-groups and posting them at a steady pace. Have a lovely Saturday night, I hope Cody is enjoying his night!